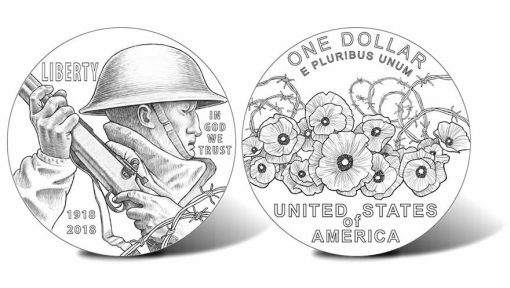 The United States Mint announced pricing for the 2018 World War I Centennial Silver Dollars and related products. Commemorating the 100th anniversary of America’s involvement in the First World War, the .900 fine silver dollars will launch Jan. 17, 2018 in collector finishes of proof and uncirculated. Earlier this month, the U.S. Mint unveiled examples of the dollars made during a ceremonial striking event. a U.S. Coast Guard medal (see Coast Guard medal designs). These medals, however, will not be available individually. Instead, each is paired with a WWI Centennial Silver Dollar and will be offered as a special set. Introductory prices are available only within the first 30 days of the commemorative’s release. The dollar and medal of each set are in proof quality. To get both commemorative coins and all five medals, collectors would have to pay a combined $548.70 during the introductory period or $553.70 afterward at regular pricing. All seven WWI products will launch Jan. 17 at noon ET from catalog.usmint.gov. Will pass on this one. Nothing looks right – the helmet, the nose, the eyes…..
What’s with the eyes? The subject looks Asian to me. The Coin is disgusting! Why not the WW1 Victory medal or the Peace dollar OBV. Did i overlook something, or is it that you can get a ” unc ” or ”proof ” silver dollar for $99.95 with your choice of a medal? Rifle on wrong shoulder, no armed services ever ports rifle on right shoulder, probably why his right arm appears detached from his body. I now remember who his nose looks like. The movie actor George C. Scott. I agree, they need better designers. For some reason, the soldier reminds me of graphic art, but not exactly, kind of a ”Jack or King ” like the ” Four Point ” poker cards, some of the medals look pretty good to me, with a few modification’s they would be even better. If i have the founds i would,int mind buying one of the sets, first pick would be ”air – r – 05 reverse” with ” air – r – 08 obverse ” Air Service Medal, if i can get in on the introductory price which are N/A as of now. BTW* i found the answer to my blog above, proof only sets, thanks. The dollar coin’s obverse is a complete failure of design and accuracy. The helmet,the clothes,the left handed soldier holding of the right handed bolt action Springfield rifle,the nose,the eyes,the face, the rifle pointed behind him while “charging” would be an easy target for the enemy. Looks more like he is retreating, running away. What’s up with the Mint? Nobody there who knows anything about WWI history. Gets you wondering who is running the Mint. Anybody there educated? This is a terrible obverse design, does a disservice to the WWI Doughboys. Just another Mint embarrassment. Is there no pride in what you do? Scrap this POS, back to the drawling board. The dollar coin obverse is a massive failure and embarrassment for the Mint. The designer of this coin is a native of New Zealand & a devout Morman like his academic colleague – devout Morman Justin Kunz (both of Brigham Young University in Utah) who designed both American Liberty $100 gold coins. Talk about “networking” with fellow artists! But, Mr. Transfield won the fair public juried competition for this coin design & will be paid the customary $5,000 for each side since he designed both obverse & reverse sides. Not bad for “moonlighting” money. This commemorative program will not make a profit IMHO & the charity will receive nothing as a few recent programs did not recoup all costs & no payout was made (Girl Scouts commens & a few others recently). Bad obverse design for sure. I like the reverse but will not buy any. I will get the silver medals from the secondary market coin & medal dealers. It would have been informative to see the runners-up for this coin design .. did the Mint ever publish those ? Or was this “juried” thing just an “in-house” decision supported by the political appointees of the CCAC and who knows which ones from the CFA ..
And like @Richard mentioned, the US enter WWI in 1917 (April 6, 1917) they got almost everything wrong .. unless they did not aim to honor those who served in 1917 .. what an insult to them ..
Notice that the 5 companion Proof silver medals are only 90% fine silver instead of 99.93% fine silver like most recent U S. Mint silver medals & yet they are priced much higher than the 2016 American Liberty Proof medals that were .9993 fine silver & were issued at $34 95 each! First glance thought, why is there a Japanese soldier on it? On the 2nd, 3rd and 4th glances, why is there a Japanese soldier on it?